Okay, but we got a foot of snow last night, and it's going to keep dumping all day today, so it will be some time before all this melts and I can take real photos outdoors. Would you prefer to wait, or shall I simulate it as well as I can indoors? At some point, I will try to recruit someone to shoot video, because actually watching the rope wiggling out from the first biner is much different than just seeing still pics of the progress. The escape from the second biner is more straightforward. Just the same, I'm confident that between text and photos, you should understand it well enough to be able to recreate it yourself. Anyway, please spell out your terms - what do you need from me? Real situation outdoors, or simulated indoors? Photos and instructions enough, or do you need video? Because if you need real video from outdoors, it could be a long time. (As I said, I'll try to do the video at some point even if you accept still shots now. Maybe my wife will agree to help if I split the $40 with her). You wont get a little wet and cold for $40. Actually go ahead and try the pictures indoors for a start and we'll see if it works. Nothing to do with cold and wet. I have no exposed rock. Yea or nay on pics indoors? I'm not going to go through the trouble for "we'll see". I already know the answer to your question. You want to know it too, then you tell me the parameters you need. Indoors or out, I dont care. What matters is if you can adequately demonstrate and explain the process. If you can do that with photos, fine. If not then do a video. Pound some nails in your kitchen wall and build an anchor off those. The only thing that matters to me is that you explain it in a way that others can understand. Okay. It'll take some time to do right. But unless things get crazy at work, I should have it for you within the week. PM sent with terms and conditions for using a 3rd party judge. My bad - haven't made it a priority. Between work, climbing, and VDay, I've been busy. Will work on it today after work and see how far i get. Did this thing ever happen? I already know the answer to your question. You want to know it too, then you tell me the parameters you need. The parameters seem to get more rigid for each possible scenario offered up. Sorry, I've been crazy busy. I'll try hard to get at least a few pics up today. I'm curious to see the results. Ha! Ya gotta love tempting fate. Of course I had to say I'll get to it today. Then all hell breaks loose at work, and I'm pulling 18 hour days. I *think* (knock on wood) I have all the fires put out, now. So, hopefully, today. Okay, so I tried photos, but they're meaningless. All it looks like is a rope unclipping from biners. So I had to go with video. I have no idea how well it will come out, since it's me operating the rope, and the video. But hopefully my explanations will be the main thing, and the video will just be explanatory. 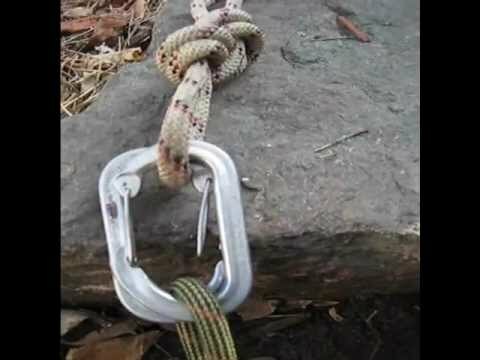 This is a $40 offer to anyone who can demonstrate a scenario of the failure of a top rope anchor using two non-locking opposed biners at the power point. 2. No manually holding the biners to force the rope thru them. 3. No wrapping the rope around the biners unless you can create a situation where this could happen un-intentionally. 4. Failure means the rope escaped from BOTH biners. Both means both. 5. No theories, microfractures, CE marks, or alien abductions. Prove it and I will mail you $40. - Static rope anchor, tied in a fig-8 knot on a bight. - The gates wind up inside the spine of the other biner. When you jostle the biners around, the gates will always settle either inside or outside the spine of the other biner. - The biners wind up sitting on the edge. A few things that could cause this are that one of the anchor points snags on something, shortening that arm, or that the anchor was set up poorly, such that when weighted, the biners are over the edge, but when some of the weight is released, the biners get pulled up onto it. If the edge is rough, the gate on the inner biner can get caught on even a small jut. Then a downward pull on the anchor can cause that gate to open. This can happen even without any sideways pull in the direction of the jut. Once the gate gets caught, the biners can rotate onto the bump on the rock, making it so that any force will cause the gate to open. Let's step back for a second - Why should it matter all that much if, when the climber's weight comes off the anchor, it can wind up sitting on the edge, and then if the weight goes back on it, it causes the gate to open momentarily? After all, I'm sure plenty of you are thinking, the biners are plenty strong enough to hold a small toprope fall, even with one gate open. And if a fall on the anchor causes it to get pulled all the way back over the edge, the gate will close on its own. But... what if there were something that could cause the rope to escape the biner while it's open? Well it turns out that, given the following scenario, that's exactly what can happen. ... continued from last post. If, while the gate is caught open on the rock, the climber goes up and to the right, the rope can get caught in the open gate. Why would this happen? Well, perhaps the leader of the group, who set up the toprope, asks the person climbing to check on the anchor, noticing that the biners seem to be sitting on the edge. Perhaps they remembered seeing something that might snag one of the arms of the anchor up on the right. Once the rope is caught under the gate, I noticed two ways it can wind up getting pulled out completely. In this step, I'll demonstrate the first way. With the climber still above and right of the anchor, the belayer takes in a couple of inches of slack. Let's step back again and see where we are. Okay, so the climber is slightly above the anchor and to the right, and is now clipped into only one biner. Technically, they're still safe, though. And, because the other biner is oriented in the opposite direction, it cannot get levered open on that nub of rock no matter how much the climber thrashes around trying to fix the anchor. And even if it did, the rope running up and to the right would never wind up going through the open gate on the *left* side. So let's say this climber doesn't notice what's happened (the anchor might be under his body) - he would lower safely to the ground. 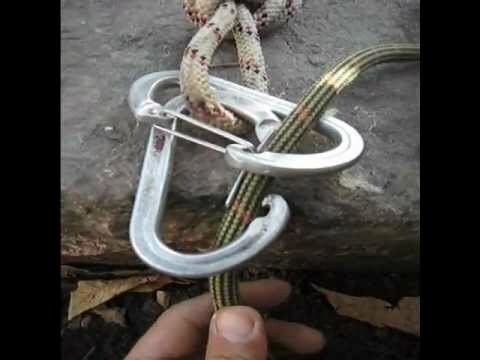 After all, both biners are still clipped to the power point, and unless he looks carefully, he might not see that one of the biners (remember, it's the bottom one, and might be slightly hidden by the top one) is not clipped to the rope. But again, he's still safe. If the next climber to do the TR ties into the other end of the rope, something interesting can happen. 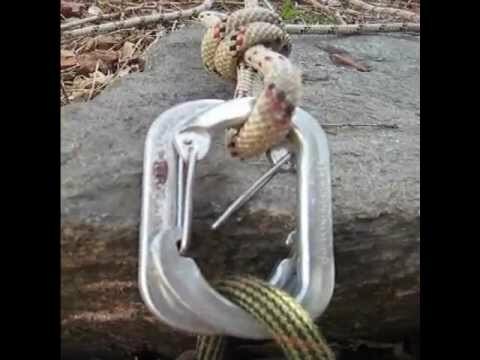 If the second climber does the same thing as the first climber (going up and right of the anchor) - let's say because this climber hopes to fix the problem the first climber didn't, the biners can be flipped over when they climb over the anchor, and will orient themselves like they were in the beginning. Sorry, I didn't think to video this step, and I broke down my setup yesterday. But if you want, I can set it up again and video it. In step 4 I showed one way that the rope, caught in the gate, can escape the biner completely when the belayer takes in a little slack. I mentioned that I had noticed a second way for the same thing to happen. In this step I'll show that second way. Of course in real life, either way could happen either time. So there you go. 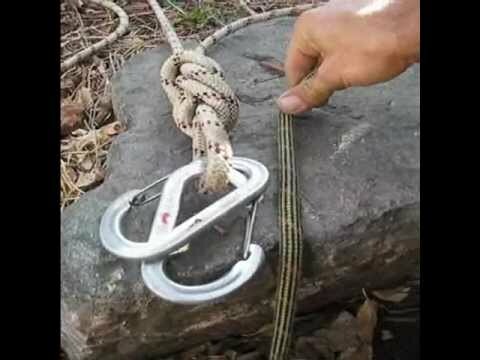 In six steps, a scenario in which a toprope setup for a standard slingshot belay fails completely, leaving the climber on belay from below, but completely unanchored. what are you going to spend your 40$ on? Not so fast. I always thought that the definition of leading was climbing above the anchor. So, by definition, this is not a standard sling-shot belay. Two points of failure - a) don't use wiregates for TR anchors and b) never have a TR located where the rock can significantly impose on the biners. Absent those points there are no circumstances where a TR of two opposed, non-locking biners is going to fail. The odds are about a billion to one better that you will die going to and from that TR anchor in your car. Following my oath of "NO SNARK" I shall not make a comment.